He appeared calm and confident and answered questions with one-word answers. 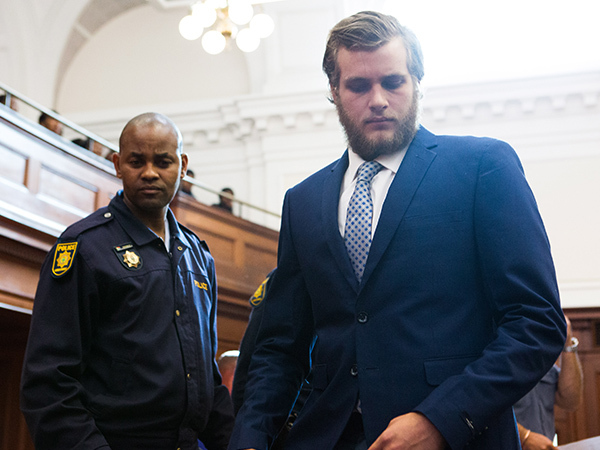 Henri van Breda conversed casually and appeared relaxed with hospital staff a few hours after his parents and brother were axed to death, the Western Cape High Court heard on Monday. Dr Michelle Van Zyl testified that she saw the triple-murder accused at the Vergelegen Mediclinic twice on January 27, 2015. The first time was at 20:25, when he asked for one of his stab wounds to be examined for possible stitches. He was accompanied by his sister Marli’s ex-boyfriend, James Reade-Jahn. Van Zyl said she had stapled the laceration, as it wasn't deep enough for stitches. The "clips" used for this simply brought the skin together, she explained. His emotional status was noted as confident, not emotional, and she detected a slight smell of alcohol on his breath. After he was discharged, he returned to the hospital at 21:25, accompanied by the police. She was informed that he was a suspect in a murder investigation and was asked to complete a J88 form. "The second time, he wasn't so friendly and jovial, like when I saw him the first time," she told the court. A J88 is an official justice department form which documents the medico-legal examination that a healthcare practitioner performs on a patient, and highlights findings that could be relevant for legal purposes, according the SA Medical Journal’s website. Last week, clinical forensic specialist Dr Marianne Tiemensma testified that Van Breda's wounds were superficial and typical of self-inflicted injuries. The only injuries he was unlikely to have caused were those on his head, back, and leg, she said. The 22-year-old is on trial on charges of murdering his parents Martin, 54, and Teresa, 55, and brother Rudi, 22, with an axe, attempting to murder his younger sister Marli, and defeating the ends of justice. He has pleaded not guilty, claiming that a balaclava-clad man attacked the family in their home in the De Zalze estate in Stellenbosch, and then escaped.